J.M. has been a sailor since he was teenager on Lake Erie and then on the Texas Gulf Coast when his family moved there. Gail became a sailor as well when they got married. They spent five years living aboard a 53-foot pilothouse ketch in the Pacific NW including trips up to Canada and Alaska. 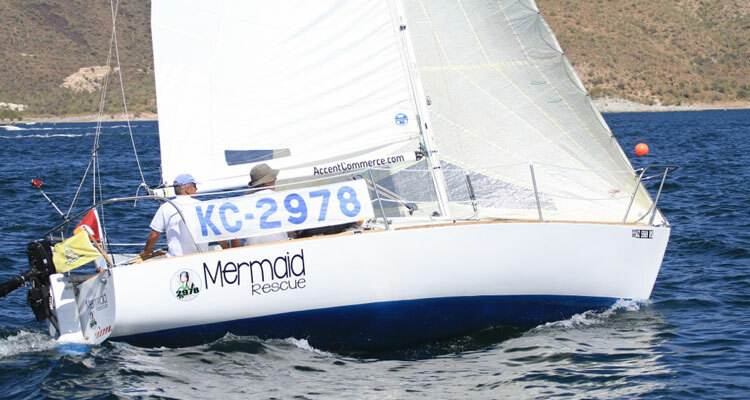 They have owned a variety of sailboats but their current boats include a Lido 14, a Catalina 22, and a C&C 31. They enjoy both cruising and racing. I should have been born with a silver spoon in my mouth–instead my baby pictures show what seems to be a tiller. How did that happen?! I was born in Malta when the Queen still ruled the rocks. Growing up on an island we subscribed to the three S’s–school, soccer and sailing. My first boat was a Mirror 10 that was raced in every season, every regatta and if no one else was out, I’d race a dolphin. All my friends had Mirrors so the competition was lively and fierce. When not trashing our little boats we always were pressed into crew service on the bigger boats–I particularly enjoyed sailing on Swans. By my late teens I attended an American college in Switzerland on Lake Lugano. Great place for the Mirror! My elaborate transportation plans were in place, called my father and as he listened in silence I waited for his reaction. “No.” But why?! He figured I would most likely not be returning to Malta so he gave my boat to the local boys’ orphanage. He was right–and I am glad my Mirror sailed on. Half a lifetime later my wife Priska and I spend two weeks in Providenciales, Turks and Caicos Islands. The Club Med has a small fleet of Hobies (the tourist “I have no idea what I am doing” ones, 16’s and even 2 Max’s). Ah, but I DO know what I am doing! That is where Priska first became a sailing widow. The following year–same thing! By the time the vacation was ending, the decision was made. Time to buy a boat. I told my best friend about it and he replied–no you are not. Excuse me?! No as in “No, you are not buying a boat – you are buying my J/24 that is sitting idle in San Francisco.” Not seeing the need to argue, the decision was easy. One great road trip later, that is how CAN2978 ended up in Lake Pleasant. From there, the name changed and the sail number changed from CAN to MLT. Incidentally, Priska still remains a widow, usually three days a week! Priska, on the other hand, was born in Czechoslovakia, spent many years in Italy and met me in Scottsdale nearly 14 years ago when I was racing open wheel cars. Our common language is Italian which is what we speak at home. She does come sailing with me from time to time (it is very sweet when she pretends to care) but I do agree with her–a “real” sailboat should be at least 45 feet, and look like something Robin Leach would want to be seen on. Which brings us back to the silver spoon…. True Story — When are you leaving?